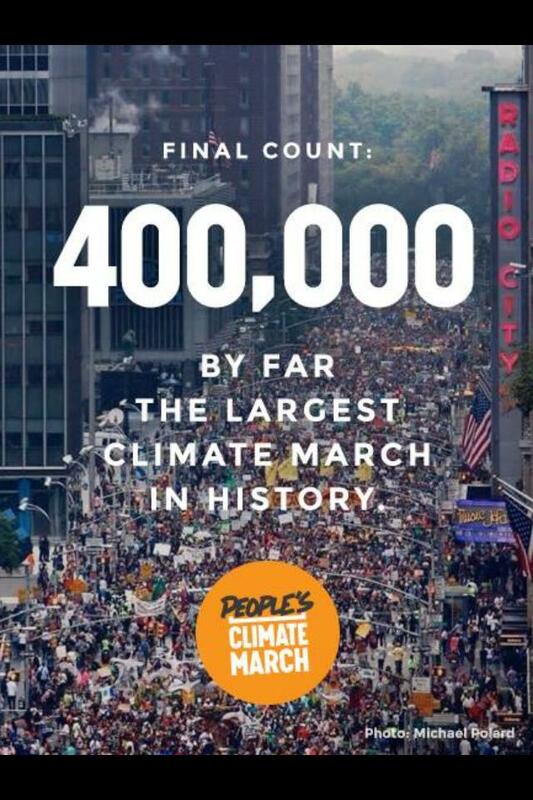 A day of hope and rejuvenation as 400,000 or more idealistic people of all ages from all over the globe came together to walk, sing, and laugh together in New York City on behalf of our increasingly beleaguered planet. The originality and creativity of home-made signs, floats and costumes complemented the spontaneous dancing, singing and camaraderie. For those of us who remember Civil Rights, Women’s Rights and anti-Vietnam War demonstrations, this may have been the first time in 40 years to hope with some realism that the people’s will might be heard, that our voices could count to persuade those with power to take long-range views and ethical positions rather greedy or expedient ones. The People’s March against Climate Change was a profoundly restorative and unexpectedly joyful experience – not just for the earth but for those who marched to protect it. It was wonderful after so many decades to again unite with others’ determination, idealism, and a shared commitment to a viable future for all.